Synchronize local directories with FTP servers. Major version updates (1.0 => 2.0, 2.0 => 3.0, …) introduce breaking changes to the previous versions. Make sure to adjust your scripts accordingly after update. … and a library for use in custom Python projects. Recursive synchronization of folders on file system and/or FTP targets. Upload, download, and bi-directional synchronization mode. Unlike naive implementations, pyftpsync maintains additional meta data to detect conflicts and decide whether to replicate a missing file as deletion or addition. Unlike more complex implementations, pyftpsync does not require a database or a service running on the targets. Architecture is open to add other target types. Runs on Linux, OS X, and Windows. Remember passwords in system keyring. The FTP server must support the MLSD command. 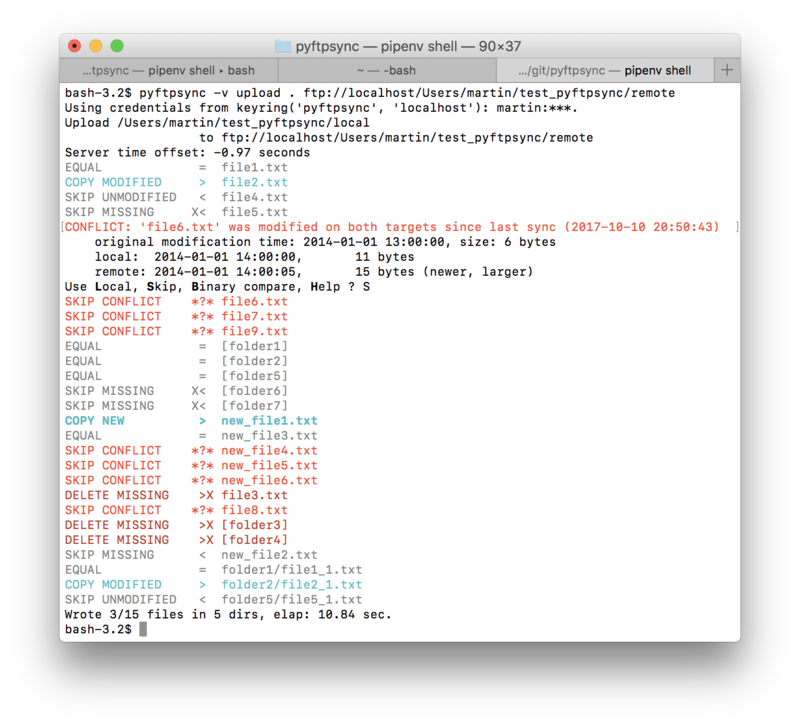 pyftpsync uses file size and modification dates to detect file changes. This is efficient, but not as robust as CRC checksums could be. pyftpsync tries to detect conflicts (i.e. simultaneous modifications of local and remote targets) by storing last sync time and size in a separate meta data file inside the local folders. This is not bullet proof and may fail under some conditions. Currently conflicts are not detected, when a file is edited on one target and the parent folder is removed on the peer target: The folder will be removed on sync. In short: Make sure you have backups. © Copyright 2012-2019, Martin Wendt Revision 0dddd5d8.